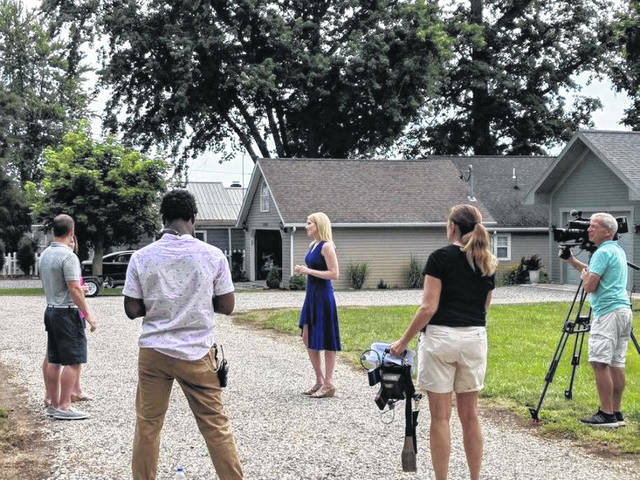 In summer 2017, a TV production crew secretly holed up in a couple hidden cottages at Indian Lake and filmed two episodes of HGTV’s “Island Life,” putting the lake in the national spotlight after the two shows aired. The network liked what they saw and came back this past summer shooting two additional new episodes. Both will air in the next two weeks and local “Watch Parties” will take place at area establishments for the community to view. Local Realtor Paige Duff of Choice Properties, who appeared in the previous two shows, will again be the Realtor in these two new episodes, bringing her reality TV show credits up to four entire shows! “When the production company emailed me last Spring asking to film more episodes, I was thrilled and said “yes” right away, said Duff. “It’s wonderful that HGTV wants their viewers to see more of Indian Lake. I’ve talked to numerous visitors and clients who saw the “Island Life” episodes last year and decided to check out our little piece of paradise,” she added. Indian Lake is a very popular vacation destination with over 1.5 million visitors a year. Recent real estate sales have been impressive. “In the past year, more than 50 waterfront homes sold for over $250,000”, said Duff. “I appreciate the production company featuring local businesses in these episodes. It’s fun to see such familiar places on national television and I hope those stores greatly benefit from the exposure,” added Duff. This year, the first episode airs Sunday Feb 10th at 10PM and will feature Chris and Tina Gibbs of Dayton, Ohio. With their six kids almost grown up, this couple is hoping to find a large lake house to bring the whole family together. Not only do they need a large number of bedrooms and baths, they also need space for a ninth member of their family, their rescue dog Charlie. They also want open views of the water and space for their boat and two jets skis. Watch as locator Realtor Paige Duff , shows the couple around Indian Lake and helps them find the lake house of their dreams. “Mimi’s at the Lake” restaurant located at 156 E Main in Russells Point, will be hosting a Watch Party with the help of the Indian Lake Chamber and Choice Properties. Enjoy inspired cocktails and free appetizers while they last. Test your knowledge of Indian Lake history before the show with a fun game of trivia. Winners will receive free tickets to the “Party at the Beach” event, a gift card or a free t-shirt. The second episode airs Sunday Feb 17 at 10:30PM. A couple from Powell Ohio, wants to slow down and enjoy life on the water by finding a dream home on Indian Lake. They hope to find a house with open views of the water, a dock for their future boat and space for their dogs to play. Cranberry Resort is hosting a Watch Party with the help of the Indian Lake Chamber, Choice Properties, and Longview Cove. Bring your friends, grab an island inspired cocktail and enjoy the second new episode of HGTV Island Life featuring Indian Lake. Test your knowledge before the show with a round of Indian Lake Trivia, win an Island Life t-shirt, and enjoy free appetizers while they last. You can also meet the cast!